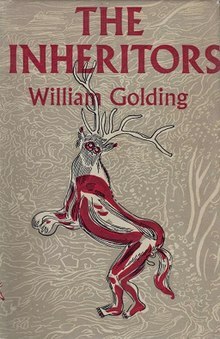 The Inheritors is a work of prehistoric fiction and the second novel, published in 1955, by the British author William Golding, best known for Lord of the Flies. It concerns the extinction of one of the last remaining tribes of Neanderthals at the hands of the more sophisticated Homo sapiens. This novel is an imaginative reconstruction of the life of a band of Neanderthals. It is written in such a way that the reader might assume the group to be modern Homo sapiens as they gesture and speak simply among themselves, and bury their dead with heartfelt, solemn rituals. They also have powerful sense impressions and feelings, and appear sometimes to share thoughts in a near-telepathic way. As the novel progresses it becomes more and more apparent that they live very simply, using their considerable mental abilities to connect to one another without extensive vocabulary or the kinds of memories that create culture. They have wide knowledge of food sources, mostly roots and vegetables. They chase hyenas from a larger beast's kill and eat meat, but they don't kill mammals themselves. They have a spiritual system centring on a female principle of bringing forth, but their lives are lived so much in the present that the reader realizes they are very different from us, living in something like an eternal present, or at most a present broken and shaped by seasons. One of the band, Lok, is a point of view character. He is the one we follow as one by one the adults of the band die or are killed, then the young are stolen by the "new people," a group of early modern humans. Lok and Fa, the remaining adults, are fascinated and repelled by the new people. They observe their actions and rituals with amazement, only slowly understanding that harm is meant by the sticks of the new people. The humans are portrayed as strange, godlike beings as the neanderthals witness their mastery of fire, Upper Palaeolithic weaponry and sailing. All save the last chapters of the novel are written from the Neanderthals' stark, simple stylistic perspective. 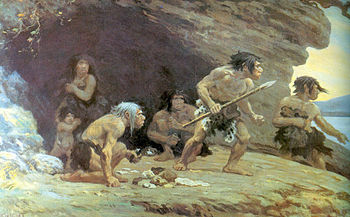 Their observations of early human behaviour serve as a filter for Golding's exercise in paleoanthropology, in which modern readers will recognize precursors of later human societal constructs, e.g., religion, culture, sacrifice and war. The penultimate chapter employs an omniscient viewpoint, observing Lok. For the first time, the novel describes the people the reader has been inhabiting through the first-person perspective. Lok, totally alone, gives up in despair. In the final chapter, we move to the point of view of the new race, more or less modern humans fleeing in their boats, revealing that they are terribly afraid of the Neanderthals (whom they believe to be devils of the forest) and of pretty much everything around. This last chapter, the only one written from the humans' point of view, reinforces the inheritance of the world by the new species. The fleeing humans carry with them an infant Neanderthal, of whom they are simultaneously afraid and enamoured, hinting at the later hypothesis of inter-breeding between Neanderthals and modern humans. The book, particularly the last chapter, was the inspiration for the song "A Trick of the Tail" by British rock band Genesis. ^ "Golding, William". SFE: the Encyclopedia of Science Fiction. Retrieved 23 November 2016.